Die hard skiers start to get amped mid-October, knowing their favorite time of year is drawing near. The three-day weekend including Columbus Day Monday is an ideal time to head to the mountains , get that season pass picture updated and drink beer..its apres ski – pre game before the first snowflakes. Columbus Weekend at Sugarloaf and Sunday River in Maine a wonderful fall traditions, with peak foliage, Sugarloaf host Homecoming and Sunday River Wife Carrying Competition. 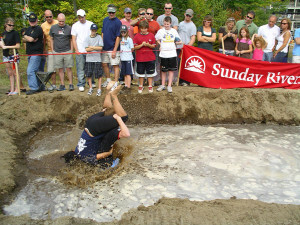 Saturday of Columbus day Weekend at Sunday River Resort is your chance to witness the Annual North American Wife Carrying Championship, this wildly popular event draws thousands of spectators to watch 50 couples crash, dash and splash through an obstacle course, over log hurdles and through a mud pit. Wives get wet and muddy, guys get hurt and the winner gets their wife’s weight in beer. Sound fun? You must see this event in person. For additional entertainment at Sunday River, the Chondola will be operating for scenic chairlifts rides, live bands will play at the South Ridge Base Lodge by the beer and wine tents, and the Annual Blue Mountain Arts & Crafts Fair takes place too. Sunday at the River is a new event, the New England Corn Hole Championship where some lucky duo will take home $500 in this classic Yankee toss. It’s also “Sunday Bloody Sunday” with Bloody Marys. For family fun, Sunday River’s Fall Festival weekend includes wagon and pony rides, chainsaw carving demonstrations, and a ski sale at Sunday River Sports. Sugarloaf’s annual Homecoming Weekend is always Columbus Weekend. Loafers come out of summer hibernation to pay homage to prime foliage, and hike 2,400′ vertical ‘to the summit – three miles, all smiles in the Uphill Climb Race, with a big finish of beer and lunch at Bullwinkle’s. 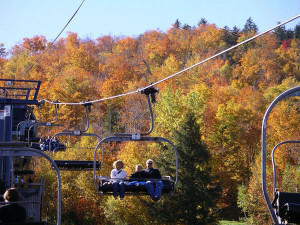 Other fun fall activities at the Loaf include the CVA Used Ski Equipment Sale, the Upcountry Artist Show, Sugarloaf’s Annual Meeting, free scenic chairlift rides, The Jay Moody Memorial Golf Tourney, and the Maine Outdoor Film Festival at Sugarloaf’s Beach. Enjoy the three-day weekend, get your ski gear out of the basement and ready to go. It’s only a few weeks till we have snow, skiing and snowboard season. Keep your skis tuned and tune back in to Family Ski Trips Trips for news and ski resort reviews and The LuxuryVacationGuide.com for travel tips and resort recommendations. From one Ski Mom to another… be brave!